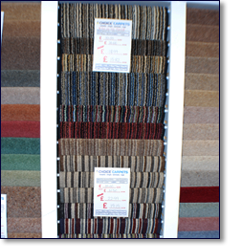 Over a thousand colours and carpet styles to choose from! Manufacturing technology has drastically improved over the last 30 years - forget past experiences you may have had with nylon. Stain resistance is now largely built into the manufacturing process as opposed to being sprayed on. When choosing 80/20 twists, nylon is better than polypropylene as the man made part. New finer fibres give very soft feeling carpets - many people are surprised to find out nylon is much softer than wool. Manufacturers give excellent guarantees against you being able to stain polypropylene (all polypropylene resists staining). Polypropylene will flatten more than nylon or wool, "two ply" effects counter this - insist on it unless you replace the carpets in shorter lifecycles (e.g. letting). Look for marketing brands such as "Stainaway", "Stainfree", "Stainsafe" etc - nearly all of them are polypropylene. You can apply bleach directly to the surface of polypropylene. Polyester is a form of plastic and is less hardwearing than nylon - best as bedroom carpets in pure form. Known for producing vibrant colours. Some people say it's odd to walk on and can sound artificial. Permits heat treatments in manufacturing process. Usually found in combination with other fibres. Types of synthetic fiber include acrylics, also called man made wool or art wool. Acrylics offer the look of real wool for much less cost but it is not as durable in high traffic areas as other fibers. Blends are often created from nylon and olefin and although durable, stains tend to affect blends more adversely than other fibers. Nylon is a popular choice for carpet fiber. 90% of home carpeting and 60% of all carpets sold are made of nylon. 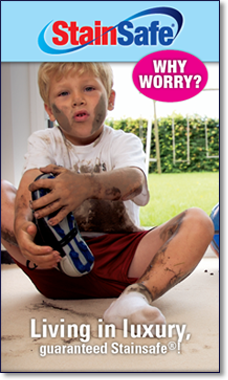 Static free, durable, and stain resistant, nylon is often the choice for home owners with small children. Olefin is another type of synthetic carpet fiber. 60% of all commercial carpeting (shops, offices, hotels,) is made from olefin. The best points about olefin are that it is stain resistant and easy to clean. Polyester, the same synthetic used in many garments, can be another synthetic carpet choice and costs less than either wool or nylon. Although it doesn't stand up to the heavy wear and tear of high traffic areas as well as other types of fiber, polyester offers a plush look desired by many homeowners. Wool is soft enough to sit on therefore easy to live with unless any of the household users have a wool allergy. It is not a wise choice for bedrooms if allergic sleepers breathe wool dust all night. Most of the pile constructions suited to wool will be relatively short because of the expense - however there are some luxury wool carpets with longer piles if you can afford them! Wool carpets are an excellent choice if you move the furniture around - compression marks recover better than man made alternatives (don't count on getting those piano marks out though!) A steam iron through a wet cloth works well. Wool carpets are most popular in twist piles because they are deemed to be easier to maintain than velvets - foot prints and vacuuming tracks won't show as much in twist. If you want twist but prefer a more rustic look then ask for heathers which are more coarsely finished. Velvet carpets are are very fine and the tufts are not twisted - some say they have a more formal or elegant look. Saxony and shag piles are longer, hence thicker and heavier than velvets or twists - not so common in wool due to the cost. Berber or loop piles are very hardwearing because it is the edge of the loop that takes the wear rather than the upright tuft. For extra wear factor look for 2 ply, 10th gauge and/or heavier weightsThe absolute king of wool carpets is the woven carpet - Axminster (patterned) and Wilton (plain twist or velvet). They are proven to be harder wearing than any other construction type and are commonly used in hotels, bars and shops for that reason. Wool hides everyday soiling better than anything else, its cell structure is the secret. There are two types of cell - the paracortex and the orthcortex - they grow on opposite sides of the fibre and at different rates. The resultant structure hides dirt and has a natural tendency to spring back up when compressed (ie footfall). Wool carpets resist staining very well but you must deal with stains as soon as you can - longer durations of staining will make permanent marks (beware teenagers that don't clean). Of particular danger are like for like stains such as biological substances - urine, wine, grease, food, blood etc. Pile densities are measured by weight or gauge. Weights will be defined in imperial terms - the weight in ounces per square yard of carpet. Weights were commonly 32 - 40 oz in the seventies and eighties, but have now reached 50, 60 and 70 oz. Stairs and lounge wear should be at least 40 oz, with 50 now becoming the average. Sixty and 70 oz carpets are considered more of a luxury cloth. Gauges refer to the amount of tufts per inch - 8 and 10th gauge being the most prevalent. As with ounces, the higher the gauge the more quality the carpet is considered and hence the greater life it has. This will be reflected in the price. Rug price's start from as little as £45. Carpet runners 4x2 or 6x2 from £5.95. Oriental Carpets & Rugs are importers and distributors of oriental, modern and traditional rugs to the trade. We stock contemporary and traditional designs in Wool and Acrylic from India, China and Europe. OCR ensures a dedicated design consultant and buying team is constantly working with our suppliers' designers and weavers from China, India and Europe to ensure our trade customers are offered innovative and progressive textures, designs and colours. Rugs with Flair is a family run business and we have successfully established ourselves as market leaders in the design, importation and distribution of quality rugs since 1984. In the last three years the company has emerged as the fastest growing rug importer in the UK. Supplying retail chains, large independent stores and all types of retail outlets in the UK, Ireland and Europe, the Rugs With Flair trademark is now highly recognised and respected.